September 14th will see the 50th Anniversary of the Southampton Boat Show and, as ever, we will be present with three exciting Cornish Crabber vessels on offer to view. You will find the Shrimper 19, Shrimper 21 and Crabber 24 MkV on the Marina Berths M001 to M003. We will have experienced staff on hand to field any questions that you may have and help you choose the right boat to fit your requirements. You can take advantage of some great Show Deals starting from TODAY! Simply click on the below link to indicate which model you are interested in and let us know your details. Offer ends at 6pm on Sunday 23rd September. Cornish Blue Sailing are proud to announce Mark Stacey as our new Charter Manager. over 12 years. Mark will be your first point of contact for bare boat and skippered charters. of both our charter clients and our boat owners. Cornish Crabber experience with Cornish Blue Sailing. will consist of a comprehensive range of the Cornish Crabbers that you are all so fond of…. We would like to offer you the chance to own one of our professionally managed fleet of brand new Shrimpers & Crabbers. Why? I hear you ask……. – Earn money from your Crabber when you are not using her. – Sail from Mylor Yacht Harbour in the heart of Cornish Crabber world. – Have your boat professionally maintained by the people who built her. – Cornish blue Staff will manage bookings and oversee handovers / returns. shared and your running costs could be totally removed subject to the yachts Charter availability. high standards they make a great purchase for someone looking for a used boat that has resisted the test of time, wind & sea. dreams is not listed please give us a call to discuss your requirements. 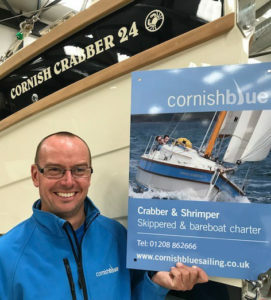 From complete refits to simple repairs, Cornish Crabbers offer a huge range of services to Shrimper, Crabber, Adventure & Mystery yacht owners. Competitive prices and unrivaled knowledge and experience make Cornish Crabbers the ‘go to’ for all your refit & repair needs. Who better to carry out work on your boat then the company that originally built her? about used boat sales please contact the ever helpful Cathy on 01208 862666.